Roberto Luongo is a franchise icon; unquestionably the very best player in Florida Panthers history. 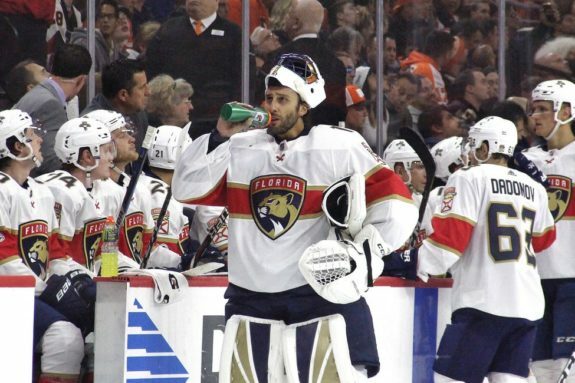 Heading into the 2018-19 campaign, Luongo not only leads the Panthers in franchise wins, with 212 – double his next-closest competitor, he sits fourth in National Hockey League history with 471 total victories, and should, at the very least, catch Ed Belfour (484 wins) for third all-time before his career is through. He’s proved popular off the ice, as well, from participating in TSN skits to his fun-loving, self-deprecating Twitter account. On a more serious note, he’s also taken a real leading role in the community, including giving a heartfelt, emotional address to fans at the BB&T Center following the mass shooting at Marjory Stoneman Douglas High School. The good-natured Montréaler is as recognisable a figure in the South Florida community off the ice as he is on it, and is as good a representative and salesman of hockey as the Panthers could ever hope to have. However, with Luongo turning 40 this upcoming campaign, it’s not unreasonable to wonder what the future holds for the netminding legend. 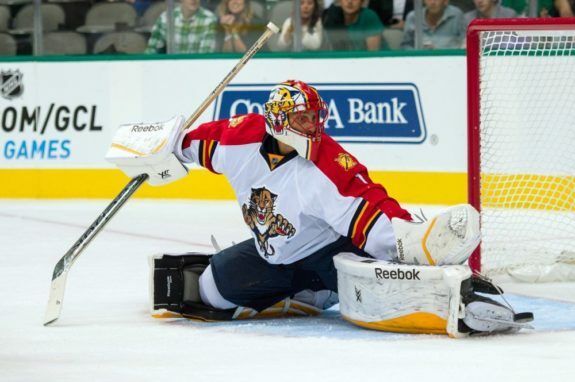 Certainly, any changes to Luongo’s status won’t be a result of his on-ice performance. Always a tremendous talent, Luongo is still well-above average when it comes to NHL netminders, bordering on elite. Luongo ranked fourth this past season in save percentage (.929) amongst all NHL goaltenders who started 10 games or more. After returning from injury in February, he started 18 of Florida’s final 30 games, winning 12 of them and helping haul the slow-starting Panthers to within a point of the playoffs. His on-ice efforts, along with his community leadership, made him a finalist for the Bill Masterton Memorial Trophy. Just two years previous, in 2015-16, Luongo won 35 games and posted a .922 SV%, leading the Panthers to the Atlantic Division title, earning Hart and Vezina votes along the way. But perhaps even more impressive than Luongo’s ongoing statistical brilliance has been the complete reinvention of his game. Once a more aggressive goaltender with a style that relied heavily on athleticism, Luongo has become much more patient and reserved in his crease. He’s more willing to let the play come to him, before leveraging his six-foot-three, 217-pound frame and near-perfect technique to frustrate opponents. Not only has Luongo stabilised and improved his on-ice results, his new, less physically demanding style is one that should serve him quite well as he ages. It takes real talent, skill and dedication to make it to the top. It takes something a whole lot more special to ensure one stays there. 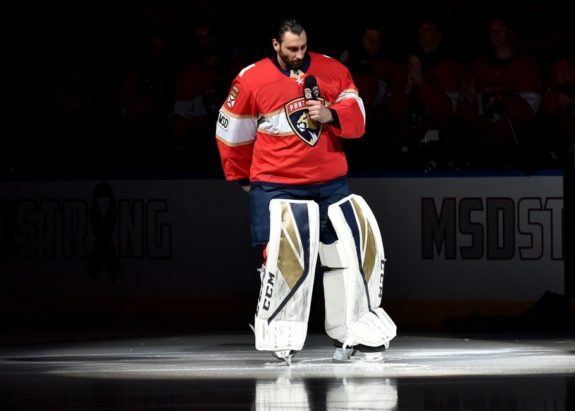 Though Luongo returned from injury and played a major role in the Panthers’ valiant push for the playoffs, it’s worth noting he also missed significant time the year previous, nursing a hip injury related to surgery he underwent in the summer of 2016. At 39 going on 40, perhaps Luongo, after years of heavy workloads – he’s played in the third-most games, and has faced (and stopped!) the second-most shots of any goaltender in NHL history – is finally feeling the effects of playing the most demanding position in the most demanding league in one of the most demanding sports. For the remainder of his career, the Panthers will have to balance the need for Luongo’s still-exceptional standard of play with the need to give him the time he needs to ensure his body remains in peak fighting form. Luongo has four years left on a contract that counts for $4.533 million against the salary cap each season for the Panthers (the Canucks, who signed him to the deal, retained $800,000 in the 2014 trade that brought Luongo back to the Cats). Undoubtedly, his desire to win a Stanley Cup is still aflame, but, like most professional athletes, Luongo will have to be in constant evaluation of his situation; whether the desire to win, camaraderie and compensation is still worth the increasing effort and mounting injuries, not to mention being away from one’s family half the year. It really seems as though he’s now on a year-to-year basis when it comes to continuing his career. A closer look at his contract suggests Luongo might consider retiring early. Cap hit aside, Luongo’s actual salary drops from $6.714 million in 2017-18 to $3.382 million this coming year. In 2019-20, it falls even further, to $1.618 million, before levelling off at an even $1 million the final two seasons. There are a few contracts like this in the league, most of which were signed before the 2012-13 lockout. Coming out of said lockout, contracts were capped at eight years (seven, if issued by a team other than the team one ended one’s previous contract with), and new salary variance rules were introduced. Still, these new rules did nothing to alter Luongo’s deal, nor others like it. Looking at comparable examples around the NHL, it seems that, at the time of signing, there was often little intent on the part of either side to see the contract through to its conclusion. Henrik Zetterberg literally admitted as such, and Marian Hossa’s de facto retirement was just a little too convenient (just to be clear, he technically isn’t yet retired, by the letter of the law). The point is, after having been paid over $60 million of his $64 million deal, it’s not unreasonable to suggest Luongo might just choose to retire following the 2018-19 season. Even if he doesn’t, it’d be a huge surprise if he actually plays out his contract, which ends after the 2021-22 campaign. Now, it wasn’t the Panthers that signed his contract, but they had to have known this was a possibility – that it was likely, even – when they dealt for him back in 2014. 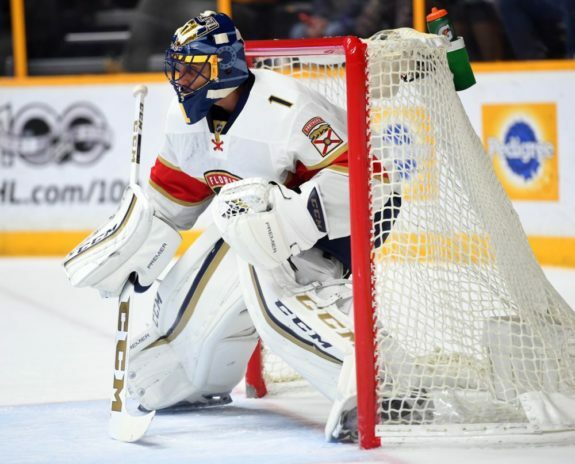 No doubt the Cats have contingency plans, so we’ll just have to wait and see what those are, should Luongo’s early retirement indeed come to fruition. An interesting aside: Perhaps it’s not the Panthers who should be worrying most about Luongo’s early retirement. The Canucks, who signed Luongo to his 12-year, $64 million contract back in 2009 (it kicked in for the 2010-11 season) will be on the hook for a significant chunk of change should the 39-year-old choose to retire early. The Panthers will face a nominal fee, true, but the penalty could severely cripple the Canucks. The NHL implementing a retroactive punishment for teams that signed contracts that were legal at the time may not seem entirely fair, but the league did it anyway, and the Canucks have to be hoping and praying Luongo lasts the duration of his deal. Of course, all this speculation may be for naught. Luongo could well continue his strong play far into his 40s, playing out his contract and riding off into the South Florida sunset a legendary figure of the game. Given the arsenal of talent the Panthers have been amassing up front, he might just have a Stanley Cup ring when he does. Regardless, Luongo will have no shortage of options once he decides his on-ice career is at an end. I’m sure the Panthers would love to keep him within the organisation in some capacity. He could also literally walk into a job in broadcasting or punditry. Heck, he could run for office and stand a pretty good chance at winning. Whatever the future holds for Luongo, the ball is decidedly in his court.